It reminded me that I took it five years ago. 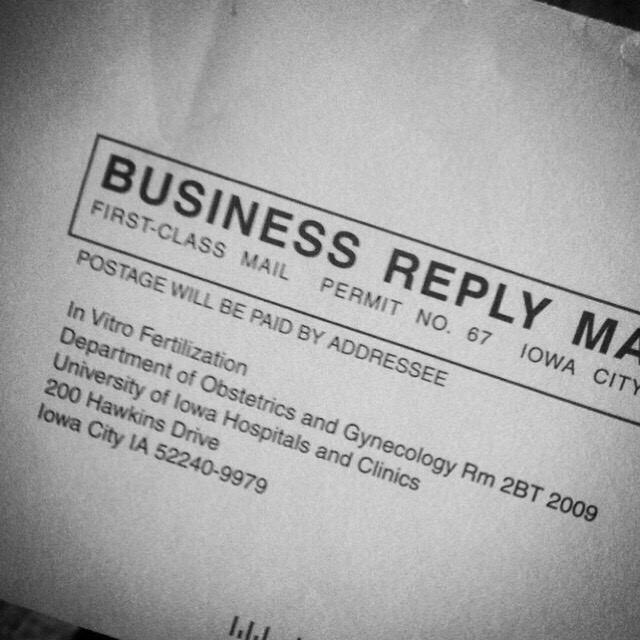 I remember placing a whole bunch of personal information in that envelope with a little bit of hope and mailed it down Interstate 380. I was scared. Nervous about needles and medication and hormones and failure. Thankfully, we got pregnant before the needles and medication. The hormones and failures inevitably followed. Girl, you’re going to grow. You’re going to grow by 30 pounds with each pregnancy and immeasurable patience. You’re going to grow to the point of almost breaking. Your skin is going to stretch, and your brain is going to stretch, and your heart is going to stretch too. And just when you think coconut oil is the answer to all that stretching, you’ll learn it’s not. Take a nap. A long one. And, when you wake up, binge watch Netflix. Time is a finite resource and in five years you’re never going to have enough. Breathe deeply. The challenges you’re facing today are preparing you for what’s to come. Go for a run. Do some yoga. Exercise those skills that make you stronger. You’re going to need that strength soon. The only thing constant is change. The minute you think you have the baby thing figured out, the second one will come along. He will turn your world upside down. You won’t sleep. And that you job you love? Yeah, you’re going to quit it. You’re going to get burnt-out. You’re going to cry and scream and clean up so much throw-up in the middle of the night you’ll literally be able to do it in the pitch-black dark. You’re going to feel like you hate your husband in the darkest moments and appreciate him in a way you never have before. It will be confusing. Ultimately, love will be what takes over in the next five years. Your love for those two little surprises will get you through the worst of times. That love will ask what’s wrong with the baby more times than you can count. And that love will eventually figure it out. You’ll wake up (yes, you’ll sleep again) one day and realize it wasn’t hate that you felt. It was the strongest kind of love. Your husband will come to define the word partner in the next five years. You’ll come out the other side loving yourself even more completely too. You’ll be driven to champion more women. Your judgments will slide away more easily. Your legs will get stronger. And those legs will carry you forward. These five years, girl, they’re going to be a hell of a ride!